carfax report = 0 get_carfax(WBA6A0C50DDZ03288, N, 2019-04-22 04:57:37|0, autos, autoID, 1283) -- 980 Security Violation. 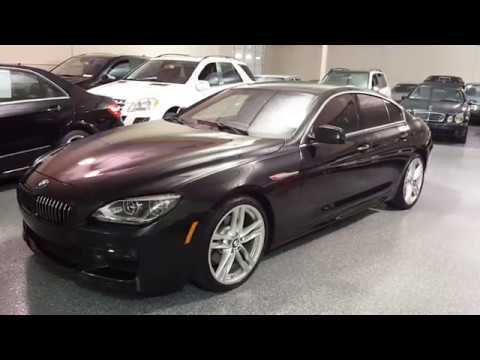 2013 BMW 640i Gran Coupe M Sport, Black Sapphire Metallic with Black Dakota leather, 44,373 miles. Previous BMW Certified vehicle, 320HP M Sports Package. M Leather heated steering wheel, M Aerodynamics Package. Rear shades, heated and cooled active comfort seats, heated rear seats, power moon roof, Black Alacantra headliner. Fine wood trim, ECO/PRO switch, factory navigation, satellite radio, premium sound with DSP, USB interface for smart phone. Park distance control, adaptive LED headlights, LED fog lights, high beam assistant, dynamic damping control. M double spoke wheels with new front tires and very good rear tires. Comfort access locking/starting, back-up camera, high speed synchro. This is the right one with all the options. Fantastic condition inside and out. Very well maintained (See Carfax). Owned by BMW fanatic. Fully detailed. EXTRA CLEAN! We offer Credit Union Financing with 60-month terms. We have drive train to bumper to bumper warranties available on most vehicles. All cars are stored indoors for your convenience and are fully detailed. Trade-ins are accepted. We are a small dealership that loves the cars that we sell! Select Motors, LTD. has been visited 13,719,055 times.